This great danger to our society (speaking of any modern civilized society and the regions immediately surrounding them or in any way dependant upon them–more or less, the vast majority of the world, not just the good ‘ole USA) is a physics phenomena called “electromagnetic pulse” (“EMP,” as it is commonly referred to). If it is ever harnessed as a weapon, as this book makes it by some unknown enemy (likely a rogue nation or mildly sophisticated terrorist organization), it would destroy everything that requires electrical circuitry to function (read: that’s pretty much everything our society uses to function/exist). 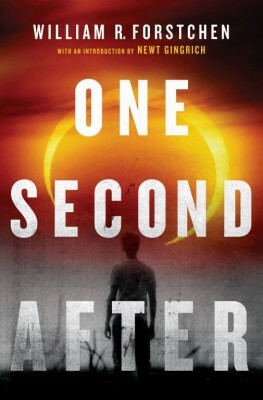 One Second After centers a story around of the lives of a small North Carolina mountain town that survives day-to-day in the apocalyptic aftermath that follows such an unspeakable devastation. The story is set in the very real town of Black Mountain, NC (just east of Asheville off of I-40). Those who’ve been to the town or are at least familiar with the area will recognize many references Forstchen makes to geography and the layout of the town itself and in relation to other bigger cities like Asheville, Charlotte, and the NC Piedmont Triad. The characters are even loosely based on his own family and friends with the main character (John Matherson, a retired Army Colonel) drawing many of his traits and daily routines from the author. The book wastes no time in kicking off right into “the problem.” While on the phone with a good friend based at the Pentagon in DC, John notices everything just simply dies. The cell phone cuts out and the power to his house seems to have gone out. He doesn’t think too much of it until he notices disabled vehicles parked in the middle of the streets and reports of cars simply stopped along I-40 make their way up into the town. Drawing from his military background, John is the first to figure out what has happened, but even still, he remains hesitant to believe it. After a few days of what everyone believes is just some freak power outage, the town’s leaders listen to John and start to proactively move into emergency management mode. Days turn into weeks, weeks into months while the book details how the residents start to band together and realize that this freak event may last longer than anyone had imagined. From dealings with an unreasonable and out of control local government of Asheville, to hearing reports from the wandering masses of people making their way up I-40 to “head to the hills” from the bigger cities like Charlotte, the book really nails all the mundane details of how life might be for these folks if something like this really happened. The story really hits home to me when Charlotte is reported as mass chaos of fire, riots, and death (as any modest-sized city or larger would be after months without electricity). And of course the story would be lacking if it didn’t address the high death toll that would be ticking upward form the very beginning (think of everyone who rely of electricity for their very life: old folks homes, people needing refrigerated medicine, etc…). Sure, it approaches gruesome at times, but that’s not the intent of the story. It’s just a real (as real as a work of fiction can get) detail of what life would be like. Just when you think you might have hunkered down for the long haul and figured out how to survive the inflicted dark ages, there would likely be the human element to deal with: the bad human element, that is. Forstchen covers this as well and even uses it as the book’s climax event. I wish I could say the story ends happily ever after, and I don’t think I’m spoiling the book by telling you that it doesn’t. If you at any time while reading this book think it realistically could end up all nice and well (like a TV sitcom always ends up putting things back the way they were at the beignning of the show), you’re likely high on the drug that has a street name of “ignorance is bliss!” While the book is certainly very entertaining (so much, in fact, that Universal purchased the movie rights to the story–no word on if/when a movie will be made), you can’t help but think it’s too bad to ever be true. Even worse, you could acknowledge that the story could absolutely be true some day which sparks all sorts of other thoughts: anger, worry, anxiety, fear, etc. Don’t get me wrong, you won’t become a wandering babbling mental case after reading this. On the contrary, you’ll become much more enlightened to the real world and the fact that it’s not always daisies and sunshine. At the very least, you’ll be a small step ahead of the vast majority of the rest of the populace if we are ever hit by an EMP–a small step that could save your life in terms of preparedness or a quicker response. To sum it up, One Second After is most certainly worth your reading time. Not only will it entertain you and keep you page turning, it’ll very likely educate you and give some insight as to how life could be. It’s worth noting to those not familiar with EMP that it doesn’t take a terrorist or act of war to hit us with such a devastating blow. A powerful solar storm (similar to the ones that are routinely thrown out by the sun–just much more powerful) could do the same thing. Communication satellites are always being subjected to solar-generated EMP, the worst of which cause regional power and communication blackouts (these happen about once every 2-5 years). If after reading this book, you feel any sense of wanting to do something about it, there’s plenty to be done. I’m not personally one to organize efforts to raise awareness or pester politicians, but that doesn’t mean it couldn’t or shouldn’t be done! I simply tell a lot of people I know about the book and our vulnerability to an EMP attack. It’s usually pretty easy to get people’s attention without freaking them out or making you think you’re some extremist nutcase. Just simply point out that most of the stuff they have on them or are using won’t work (watches, cell phones, laptops, iPods, hearing aides, pace makers, glucose monitors, their vehicles–any thing with a circuit board in it). then ask if they could live without all that stuff for a week…a month…a year. The answer is usually tragically “no.” Some folks may want to try to re-elevate (get the EMP Commission report back on the table) this to a political level and get Congress thinking about taking at least some minimum measures to ensure the continuity of our country after an attack or natural occurrence. What exactly are those measures? One method is basically large-scale surge suppressors–just like the one you have behind your TV and stereo in the living room. An EMP induces a current in our electrical infrastructure (the power lines running everywhere in our country) which can be stopped with a high-capacity and quick-reacting suppressor. The surge from an EMP is somewhere in the neighborhood of 50 times more powerful and quicker than a typical lightning storm surge. therefore, your wimpy suppressor behind your TV won’t stand a chance to stopping it. But a “hardened” suppressor could. Sure, they cost more money. But you don’t need one on every TV. They just need to be in critical locations on the power grid. Another step is creating “EMP-proof” bunkers or storage facilities–now I’ll admit, this is where the proactive approach starts to lose people and gets written off as fanatical, but it’s actually very easy to build. There’s a device called a “Faraday Cage” which is simply a cage-like structure made out of fine metal mesh (the mesh being almost like the screen on a porch). This device intercepts electrical or magnetic waves traveling through the air (like an EMP) and harmlessly disperses is around the contents of the cage. Expand this to the size of a warehouse (or even to a person level at your house of a cabinet in the garage), and everything electronic that you place inside would be completely protected from an EMP. Sounds simple, doesn’t it? With today’s world being continually pestered with the likes of Iran and North Korea, the threat of a man-made EMP attack is very real. In fact, the scenario in the book suggests that some country or organization with the relatively simple capability of launching three average-sized nuclear bombs into earth’s ionosphere could produce the magnitude of devastation presented in the book. So the next time someone downplays a rogue, irresponsible nation having just one or two nukes, remember all of this. It’s not the physical destruction of the bomb that could harm us, it’s the seemingly intangible frying of our circuit boards that would cripple us in a matter of month, ultimately leading to the fall of our society (read: likely your death!). This entry was posted in Book Reviews and tagged apocalypse, book, EMP, military, NC, terrorism, War. Bookmark the permalink.